Football has taken Bishop Sankey to nearly every corner of America. During the weekend, football and family brought the University of Washington product to Harding Stadium. 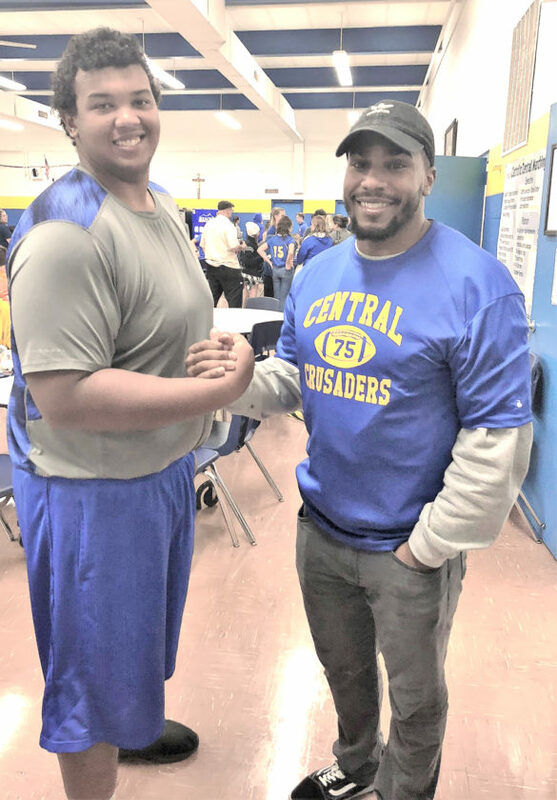 Sankey, who has been on the roster of four different NFL teams, was in town to support his half-brother, Jordan Maul, during Catholic Central’s annual Parents Night event. Each year prior to the home opener, CCHS introduces its football players along with their parents and family members. “It’s just great to be here and support my little bro,” Sankey said. “I know my being here means a lot to him. Obviously it’s early in the season but it’s a pretty big game. Sankey and Maul, a two-way senior lineman for the Crusaders, are the sons of Christopher Sankey. “Having him come here to support me was a really cool experience,” said Maul, who’s listed in the Crusader program as 6-foot-4, 350 pounds. “I don’t get to see him often because of his busy schedule. Sankey attended Gonzaga Prep in Spokane before going on to Washington. He appeared in 38 games for the Huskies, starting the last 25. He carried the ball 644 times for 3,496 yards, the third most in Washington history, and scored 37 touchdowns on the ground. He also added 567 yards and one more score on 67 receptions and 134 yards on seven kickoff returns. The Tennessee Titans selected Sankey in the second round of the 2014 NFL draft. He scored his first NFL touchdown against Indianapolis on Sept. 28, 2014, and finished his rookie season with 569 yards on 152 carries and two touchdowns. He opened the 2015 season with a career high 74 yards on 12 carries and a score. However, following Week 6, Sankey would receive only eight more carries. He started just three games in 2015, down from nine during the previous year. He was released by the Titans in 2016 and joined the New England Patriots’ practice squad. Later that season, he moved to the practice squad of the Kansas City Chiefs. On Nov. 25, 2016, Sankey joined the Minnesota Vikings. Unfortunately, in the first game of the 2017 preseason, he tore his ACL and was ruled out for the season. “We stay in contact and I know he’s excited for his senior year and excited about how it has gone so far,” Sankey said about his relationship with Maul. “We talked before the game and he was ready to go and I’m excited to watch him play. Unfortunately for Maul and his Central teammates, it didn’t go well. Southern Local hung a 26-13 defeat on the Crusaders. “We got to hang on at the fish fry after the game and he told me to hang in there and keep pushing,” Maul, who’s also the son of Stacy Maul, said. “He reminded me that one game doesn’t make a season. Sankey remains hopeful that he will soon return to the NFL. “I’m open to any opportunity,” he said. “I’m a free agent right now, so I’m just waiting around and staying ready for that call. I tore my ACL early in training camp last year so it’s been a process trying to come back for that. Thanks to its thrilling 26-20 victory over James Monroe, Weir High stands as the only remaining unbeaten team in The Herald Star/Daily Times coverage area. The game film showed Mohler was stopped just inches from the goal line. The Weir trio seemed to come out of nowhere to record the victory-saving tackle. Weir is ranked sixth in West Virginia Class AA according to www.wvtailgatecentral.com. Bluefield is first followed by Fairmont Senior and Bridgeport. Those schools square off Thursday. 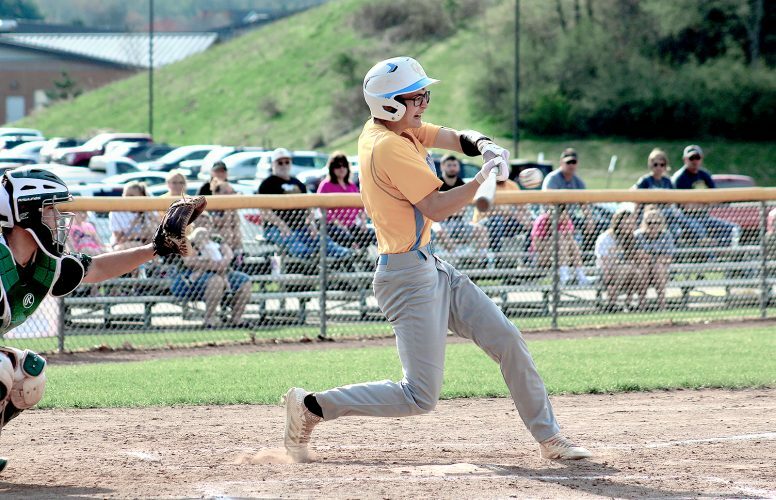 Tony Filberto’s crew is back in action Friday with a home game against Keyser. Filberto said Keyser has most of the linemen back from the team that beat Weir a season ago. Three weeks of the high school football season are in the books and Joe Eitel again is becoming a household name across the Ohio Valley. Eitel, of course, is the guru of the state’s playoff system. At the moment, Eitel’s weekly ratings have Big Red holding down the sixth spot in Division IV, Region 13. Hubbard is one followed by Poland, Perry, Salem and Youngstown Cardinal Mooney. Carrollton is seventh with Struthers in eighth place. Indian Creek is 10th. Edison is 11th in Division V, Region 19 and Catholic Central is 14th in Division VI, Region 21. Those teams square off Friday in Richmond. Kwadre Williams and Clayton Criss both had huge games in Big Red’s Week 3 victory over Canada Football North St. Joseph. Williams was in the St. Joe backfield so often it was a wonder he didn’t take a handoff from the quarterback. The senior defensive linemen recorded three sacks and also blocked a punt which led to a Steubenville touchdown. Criss, on the other hand, overcame a shaky start (he threw two early interceptions) to pass for 306 yards and a touchdown. He hit Erik Lulla for an 84-yard score. Lulla, Big Red’s outstanding middle linebacker, now has three career receptions with two producing touchdowns. Weir High junior Sebastian Spencer intercepted two passes against James Monroe but his second one was as good as it gets. The Red Riders had just tied the game at 20 on Donavan Kirby’s 29-yard run that ended with him going into the end zone with a James Monroe defender on his back. The Mavericks started a drive at their own 20 and advanced to the 41 in four plays thanks to a pass interference call on Weir. Monroe Mohler’s pass was tipped by Weir linebacker Chris Helms and Spencer went airborne with a dive and got his hands under the football just before it fell to the turf. All teams practice the tip drill and it paid off for the Red Riders. Spencer’s pick set up a 56-yard scoring drive that culminated with Kirby’s 6-yard blast to the end zone and the game winning touchdown. Shane Zrinyi recorded a stat oddity of sorts in Indian Creek’s tough 26-13 loss at Alliance. The senior caught five passes for 69 yards and a score before taking over at quarterback for the Redskins. He then completed five passes for 50 yards and another score. Creek will look to bounce back this week when it travels to Buckeye Local. Oak Glen had two 100-yard rushers in its 35-21 victory over Buckeye Local. Ethan Mick compiled 129 yards on 15 trips and a touchdown. Meanwhile, Paxton Shuman rung up 104 on 19 carries and also crossed the goal line. As a team, the Golden Bears finished with 249 rushing yards. Golden Bear quarterback Nick Chaney completed 11 of his 20 passing attempts for 179 yards and two touchdowns. Edison improved to 2-1 with its 25-24 road win at Toronto. The Wildcats went ahead 25-22 with 5:47 left on a 5-yard run by senior quarterback Anthony Sinicropi. Toronto had a chance to answer thanks to a 54-yard burst by Kobe Herrick, which gave the Red Knights a first and goal at the Edison 1-yard line. Edison’s defense stepped up, however, and stopped Toronto short of the goal line four times. Kaleb Waggoner had a big game for Edison, rushing for 107 yards and three scores. Central could manage just 236 total yards in its loss to Southern Local. Senior quarterback Justin Hartzell had a hand in 209 of those yards. Hartzell carried the football 18 times for 109 yards. He also completed 11 passes for another 100 yards and a touchdown. For the season, Hartzell now has 352 rushing yards to go with 366 yards through the air.